The words and wisdom of Panasonic Corporation founder Konosuke Matsushita have been highly influential for leaders across generations. One global business leader who has especially taken Matsushita's lessons to heart is Tadashi Yanai, Chairman, President and CEO of Fast Retailing, the world's third largest apparel manufacturer and retailer in terms of sales. 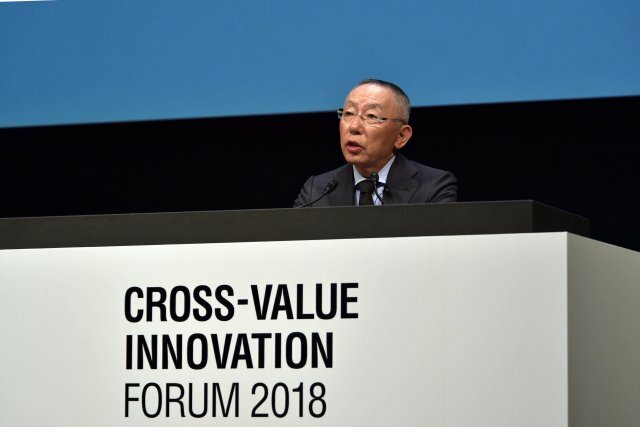 At a special keynote lecture at the Cross-Value Innovation Forum held in Tokyo as part of Panasonic's 100th Anniversary celebration, Yanai explained how lessons from Panasonic's founder helped enable Fast Retailing's astounding global success. The man behind the iconic UNIQLO brand also touched upon what Matsushita's insight means for his organization, and his hopes and expectations for Panasonic in the future. "I am a great admirer of Konosuke Matsushita and the Panasonic brand," Yanai told a packed hall at the Tokyo International Forum. He explained how he first encountered Matsushita's business philosophy when he took the reins of his father's retail business, which later became Fast Retailing. When a number of employees left suddenly, Yanai was virtually in charge of all business functions like accounting, marketing and human resources. It was a challenging time for Yanai, and he needed to learn about management and business from scratch. In the early 1970s, it was this need that brought him to the books of Matsushita, which were widely available. Yanai noted that one of Matsushita's sayings on how each employee should think like a manager had a major impact on his thinking about corporate management. This wisdom has informed Fast Retailing's "Global One" principle that encourages all Fast Retailing Group employees to share their success stories and best practices with each other. Yanai explained that Matsushita's "tap water philosophy" was also a major influence. Yanai was referring to an announcement in 1932 where Matsushita said that "the mission of a manufacturer is to overcome poverty by producing an abundant supply of goods," similar to the plentiful supply of inexpensive tap water, and to "bring happiness to people's lives, and make this world a better place." Yanai added, "That is also the true mission of our company. Fast Retailing identified with that way of thinking." Although Fast Retailing conducts its business in an industry sector different from Panasonic's, Yanai noted that Fast Retailing's mission has much in common with the tap water philosophy. As a case in point, Fast Retailing seeks to "provide new value, and the happiness and satisfaction of wearing good clothes to people all around the world." Yanai also noted that, like Panasonic, Fast Retailing's corporate activities aim to enrich people's lives and develop in harmony with society. With approximately 3,500 outlets around the world, Fast Retailing's success as an apparel manufacturer and retailer is undisputed. Yanai explained that one reason behind its success is its "LifeWear" concept, which he described as the "democracy of apparel," with the company promising high-quality, affordable daily clothes for all walks of life, similar to Matsushita's approach to manufacturing. While noting Panasonic's past success and its critical role in raising living standards, Yanai challenged Panasonic to set even bigger goals for the future, even to the point where they defy common sense. "Panasonic enjoys the DNA of Konosuke Matsushita, the world's greatest entrepreneur, so I am expecting a lot of you," he said. Injecting his trademark humor and keen observations, Yanai gave a wish list of products he would like to see from Panasonic in the not-too-distant future. Taking a page from UNIQLO's "LifeWear," one of these was a concept he called "LifeCar." Yanai expressed his wish for Panasonic go beyond supplying automotive batteries and provide a complete car that is radically different from conventional automobiles. Taking note of small and inexpensive cars that are proliferating in rural parts of China, he said there is big opportunity for Panasonic to capitalize on this trend by utilizing its technologies and expertise in quality, design and mass production to provide cars that are both easy to use and highly affordable to people all around a world. Noting how residential homes do not match changing lifestyles, Yanai laid another bold challenge for Panasonic to take up: "LifeHome." "There is an opportunity to provide a truly unique product at both high volumes and reasonable prices," Yanai explained. These residential homes should be compact, safe and comfortable, and come pre-installed with solar panels and batteries. He joked, "Of course, these homes should come with UNIQLO clothes in the closet." Yanai even went so far as to set bold sales targets for his business ideas: 1 billion units worldwide for both the LifeCar and LifeHome. "But don't worry," he said, "you can use these names and ideas at no charge. This is exclusive to Panasonic." Concluding his presentation, Yanai returned to Matsushita's philosophy and how it holds the key to long-term success. He said, "there's no organization that wants to work with a bad company, so if you want to prosper over many years, you have to be a good company." He added, "Konosuke Matsushita taught me the fundamental principle that business is about enriching customers and society."